Looking for an easy and effective way to remove stubborn, stuck-on food? Whether it’s the result of an ineffective dishwasher, a busy lifestyle or (let’s be honest) laziness, we’ve all been met with cutlery and crockery covered in baked-on food. But what’s the solution? As well as exploring some of the best dishwasher pre-treatments, we spoke to appliance experts at AO.com, who advised us on new technologies designed to make daily chores all that much easier: namely Hotpoint’s range of dishwashers, which come complete with 3D Zone Wash (more on that, later). So, whether you’re looking for handy hacks, tips and tricks to remove stubborn, baked-on food or are seeking a long-term solution that makes use of modern technologies to tackle daily chores, this feature was written with you in mind. Offering next day delivery on a wide range of products and an unrivaled 5* rating on TrustPilot from over 100,000 customers, make AO.com the go-to for all your electrical need. Keeping its customers’ needs in mind, AO.com are proud to stock Hotpoint’s range of dishwashers and can guarantee price matching, meaning you won’t be left out of pocket. Prevention is better than cure, right? So, if you’re regularly left with stubborn food left on your cutlery and crockery, it might be worth thinking about adopting a technique that will prevent this from happening in the first place. Fill your pot or pan with warm water – ideally it should cover any areas that you’re trying to remove food from – or leave cutlery and crockery to soak in a warm sink full of water, along with a generous helping of washing-up liquid to work on the grease, grime or baked-on food. Leave for a minute or so before placing in a dishwasher that’s designed to tackle even the most stubborn of stains. 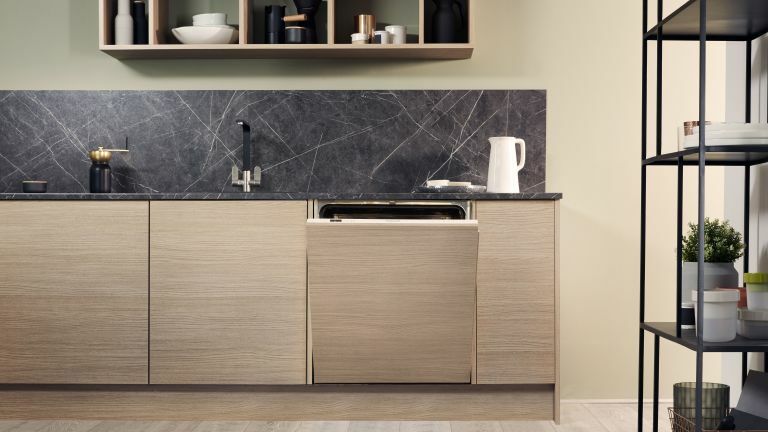 If part of your problem is an ineffective dishwasher (we’ve all been there), it’s worth considering an upgrade to a model that maximises modern technologies and is designed with effective dishwashing in mind. Hotpoint’s range of dishwashers, complete with handy 3D Zone Wash technology, are built to remove even the most stubborn of dirt, grease and grime, saving you the hassle of having to hand wash cutlery, crockery, pots and pans even after they’ve been through a dishwasher cycle and is a handy means of making your dishwashing experience more efficient. The combined action of the powerful water jets from the upper and lower spray arms and the variable speed inverter motor, makes sure precisely the right amount of water is used throughout the selected basket for either 40% more cleaning power* or 40% more energy efficiency**, depending on your needs. So, in addition to saving time, you can also benefit from saving energy (and therefore money). As if all that wasn’t enough, AO.com are currently offering an incredible 50 per cent off on installation with certain models, plus 6 months of free Fairy detergent from 25th February until 31st March 2019. Hasta la vista, stubborn, stuck-on food. *Average percentage of performance increase vs a non-3D Zone Wash appliance running Intensive cycle, obtained on 17 different items with different typology of dirt. Test results verified by VDE. ** Verified in the Report N° 236127-AS6-1 by VDE Test Institute. If you know anything about chemical-free cleaning, you’ll likely have heard about the magical properties of combining baking soda and vinegar and will be pleased to know that it makes for an all-natural dishwasher pre-treatment for extra stubborn stains. Fill your pot with just enough water to cover any areas that need treating – you’re aiming for a higher concentration of cleaning solution, so keep water to a minimum. Add approximately 240ml of white vinegar into the water solution, giving it a good stir. If you’re dealing with a pan, place it on the hob uncovered and bring to a gentle boil. Once the solution begins gently boiling, remove it from the heat. Add approximately 2 tablespoons of baking soda to the solution, paying particular attention to areas where food is particularly stuck-on. Once the 30 minutes are up, place your pots in the dishwasher. Stubborn, stuck on food should gently lift away, no problem. One of the more unexpected options available if you’re looking for a dishwasher pre-treatment to remove, stubborn, stuck-on food, is Alka-Seltzer. Simply add warm (not boiling) water to your pan or plate, ensuring all areas with stuck-on food are covered, and drop in as many as six Alka-Seltzers. After the tablets have finished fizzing, leave the solution for up to one hour before placing in the dishwasher. Voila! We’re not entirely sure why this one works, but it does, and we’re excited that a household item can work so effectively as a handy pre-treatment in those instances that we’ve let food set on plates for a bit too long. Take a used, or new, tumble dryer sheet and submerge it in a pot or pan filled with warm water. Leave the solution to soak for up to an hour, before placing on a regular dishwasher cycle. Of course, with Hotpoint’s use of cutting edge dishwasher technology, you shouldn't need these pre-treatments. But they are great to have in your arsenal if you haven’t upgraded just yet. Once you have, you can say goodbye to your scourers, for good.